This particular product is made in Taiwan and is not one I have purchased before, although it looks very much the same as other varieties. The ingredient list is fairly simple and, though soy sauce is listed, this is not readily apparent in the color so, possibly, it is used only in the initial pickling process and not during the final bottling. In addition to chili (red pepper), there are other unidentified spices mentioned, but neither they, nor the chili, for that matter, are strongly represented in the eventual gustatory experience. The bamboo, as you can see, is cut into thin matchstick shreds and these are immersed in soy oil that has a pretty reddish color (presumably from the chili). The aroma of the product, on opening the jar is, I have to say, one that is very difficult to describe. It would be a bit of an easy way out to simply say that the smell is of fermented bamboo and the best description I can give is that the fragrance is somewhat like very earthy mushrooms with a background of new leather. The texture of the bamboo itself is quite pleasing and has a little of the nice ‘al dente’ quality of properly cooked pasta. It is, I would have to say, a bit like a cross between marinated button mushrooms and salted radish. As for the taste, this is, again, not easy to describe unless you have experienced preserved bamboo before. The mushroom quality of the aroma comes through but it is even earthier and the umami quality very strong. 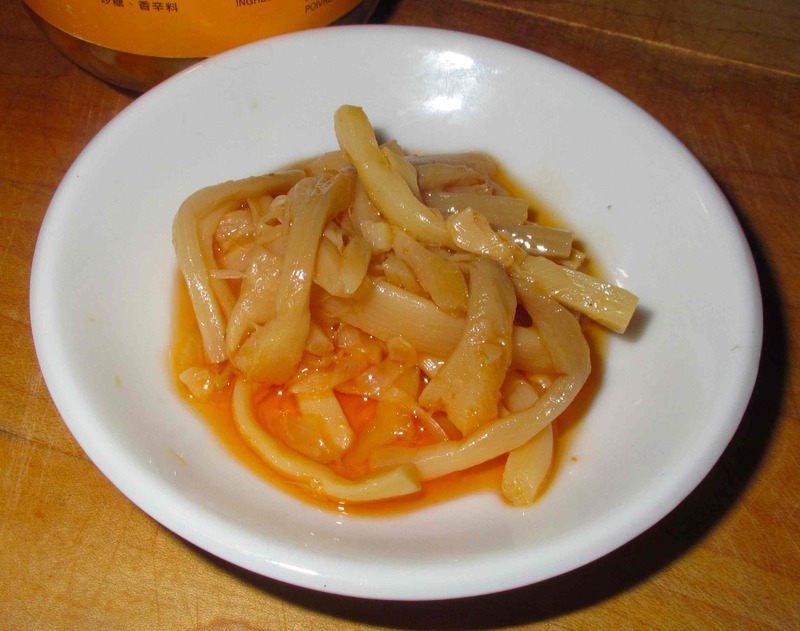 My wife and I both enjoyed pickled bamboo the very first time we had it but I suspect that, for some, the ‘funkiness’ (and I can’t think of a better word) might be something of an acquired taste. This brand, as I say, does not actually have much in the way of chili flavor (despite the reference to ‘鮮辣‘ on the label). Indeed, I was really unable to detect any heat to it at all and the other ‘spices’, as mentioned in the ingredient list, are impossible even to guess at. Still, that is not too much of a flaw as far as I am concerned; a little chili heat can always be added and the product, as flavored, is therefore that much more versatile. 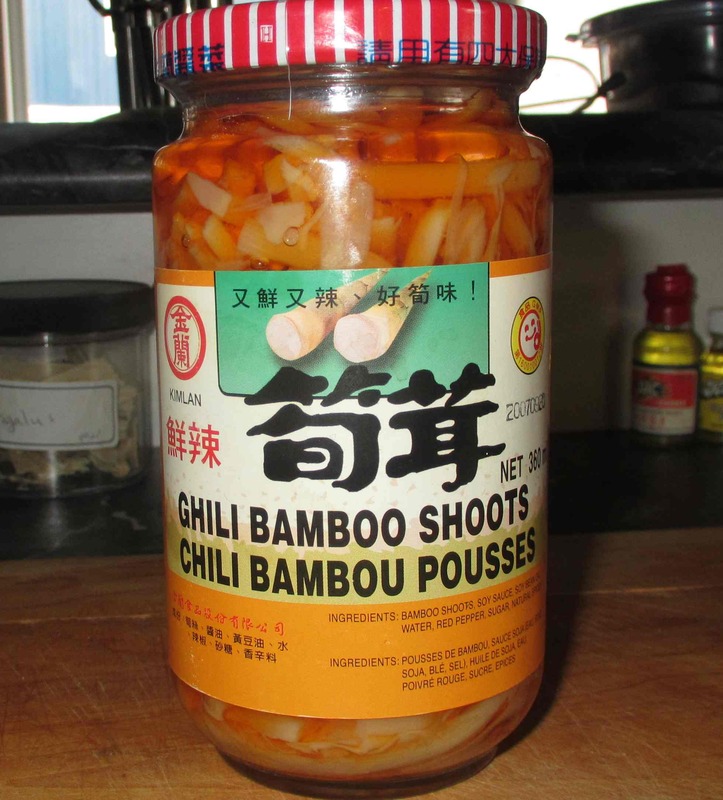 Ultimately, the label does promise ‘好筍味’, or ‘good bamboo shoot taste’, and that is exactly what is contained within. Thank you for reviewing this.. I see these different, more exotic versions of bamboo and never know if they’re worth the risk of buying! These sound excellent! I think they are the sort of thing you immediately love or hate .. not much middle ground. I like your post because I really appreciate your spirit of “investigation” , like trying to find out more. But I never eat this type of food. Therefore I cannot say that I like it. Anyway, thanks for sharing. Hmmm….funny enough, I love bamboo shoots! If I can find this, I think I’ll give it a whirl! So was it spicy or not too much? I love a bit of spice! No… didn’t live up to the name spiceiness-wise… but you can always add! I’m all about anything with chilli and pickled. If I had to be a sauce I would be sriracha or Louisana hot sauce. This one is not that hot … you can easily add a bit of chili oil though. You seem to have a hard time describing the smell of this stuff, so I’ll share my impression. It smells almost exactly like human feces. Fun!